This will consist of one treatments per person, per day. The exact nature of these treatments will be decided by our in-house vaidya [ayurvedic doctor] after a personal consultation with each client to ascertain their body-type [prakriti] and particular physiological [dosha] imbalances. 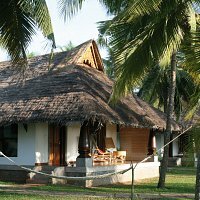 Arrival and departure transfer / Accommodation in a Deluxe Cottage / All vegetarian meals and all Ayurvedic drinks / One hour houseboat cruise through the enchanting local backwaters / Morning Signature tea / Bottle of wine / Ayurveda Treatments / Yoga Instruction for 60 minutes each morning / Consultation with resident Ayurvedic doctor. Ø Rates are in Indian Rupees including taxes. Ø Supplement (extra cost) from 15th December to 28th Feb will be INR 3000 Nett Per person per night. Rejuvenating whole bodies massage using medicated oil chosen according to body-type. Performed by two therapists working in tandem, whose synchronised movements harmonise the rhythms of all the body systems while enhancing proper and balanced energy flow through the gross and subtle bodies. Abhyanga increases blood circulation, lymphatic flow, relieves fatigue and aches and pains and generally relaxes and nourishes the body and strengthens immunity. It also relaxes the mind and smoothes the emotions. Warmed and medicated oil is rhythmically squeezed from linen cloths all over the body by two therapists with a simultaneous gentle massage. This is a remedy for eliminating toxins stored in the body, that often manifest as arthritis, rheumatism, debility, nervous disorders and certain skin diseases. Warm herbal bundles in cotton and medicated oils are applied to the effected area. Used to combat conditions such as stiffness, pain and inflammation, this treatment is recommended for a minimum of three days. Cloth bundles filled with a preparation of medicated rice are soaked in a decoction of nutritive medicinal herbs and milk, and then rubbed over the entire body. The effect is highly rejuvenating, and treats neurological weakness, muscle wasting, degenerative diseases and certain types of arthritis and rheumatism. In this treatment, medicated oil, chosen according to your body type, is poured continuously over the forehead in a gentle flow, accompanied by a gentle scalp massage. This delightfully soothing procedure is very effective in treating insomnia, mental stress and tiredness, anxiety, headache and migraine. Yoga is an indispensable aid to good health, bearing in mind that the W.H.O. defines health as ‘a state of complete physical, mental, social and spiritual well-being and not just an absence of disease’. Our yoga programme at the Hermitage is under the tutelage of Shri Anil Kumar (DYS; PGYT). Anil studied at Kannur University where he gained a diploma in Yoga and Ayurveda, then at the Yoga Vedanta Forest Academy in Rishikesh, and finally at Swami Vivekananda Yoga University (SVYASA) in Bangalore, the most highly reputed yoga research institution in India. Anil has been teaching classical Hatha Yoga (Ashtanga Yoga School) for eleven years. His emphasis is always on ease and naturalness, so that the body is cultured and the nervous system refined of its impurities in a gradual and systematic way. 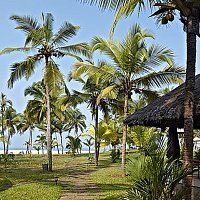 All our yoga classes take place in the Patanjali Yoga Hall overlooking the beach. Meditation component: Supplement cost INR. 2750 for 2 days, INR. 4000 for 3 days and INR.6500 for 5 days per person. This is also a variable option, depending on the interest of the client. Meditation is taught on a one-to-one basis, for 2 to 5 days. All the details can be arranged between the client and the meditation instructor. "Each of the programmes / treatments outlined will begin with a consultation with our resident ayurvedic doctor. The consultation will last about twenty minutes and ascertain the clients case history, pulse diagnosis, blood pressure etc. to determine their body-type and modalities of treatment suitable to them. Therefore we reserve the right to modify the treatments described if deemed necessary by the doctor’s consultation". “Treatments timing include Shower and Herbal body Scrubs”. 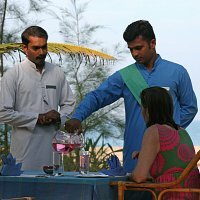 Each of the programmes / treatments outlined will begin with a consultation with our resident ayurvedic doctor. The consultation will last about twenty minutes and ascertain the clients case history, pulse diagnosis, blood pressure etc. to determine their body-type and modalities of treatment suitable to them. Therefore we reserve the right to modify the treatments described if deemed necessary by the doctor’s consultation. Treatment timing include Shower with Herbal body Scrubs.